3.0mm wide band with princess cut diamonds alternating with round brilliant cut diamonds. Available in 14k yellow gold. 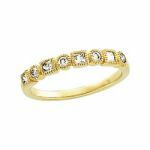 2.0mm wide band in your choice of 14k white, yellow or rose gold with (12) diamonds. 8.0mm wide band that has an open work design. Featuring .60 carats total weight of genuine blue sapphires and diamonds on a 3.3mm wide band. The princess cut sapphires and round brilliant cut diamonds alternate in bezel set frames that have millgrain edging. 3.0mm wide band with princess cut sapphires alternating with round brilliant cut diamond accents. 3.0mm wide band with princess cut alternating with round emeralds. 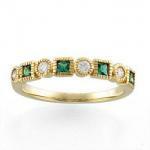 3.0mm wide band with princess cut emeralds alternating with round brilliant cut diamonds. 9mm wide band that is studded with micro pave' cubic zirconia with a rhodium plated finish. Sizes 6, 8 & 9. 9mm wide band that is accented with pave' set cubic zirconia with a rhodium plated finish. Size 5, 7 & 8. 9mm wide channel set princess cut cz band with a roped border and vintage embossed pattern on the sides. Size 7. This hand engraved mounting fits (3) 4.5mm .33 carat accents for a total weight of 1.0 carat (stones sold separately). Matching hand engraved wedding band available. Cast per order using molds of actual antique rings or original hand carved dies. Available in 14k white gold, 14k two tone white and rose gold or 14k two tone white and yellow gold.